Simon & Schuster, 9781451627220, 336pp. FOR FAR TOO LONG, the menace of concussions has been hidden in plain sight. On playing fields across America, lives are being derailed by seemingly innocuous jolts to the head. From the peewees to the pros, concussions are reaching epidemic proportions. This book brings that hidden epidemic and its consequences out of the shadows. This book puts a human face on a huge public health crisis. 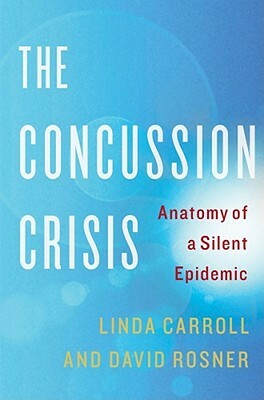 Through narratives that chronicle the poignant experiences of real people struggling with this invisible and often unrecognized brain injury, Linda Carroll and David Rosner bring home its potentially devastating consequences. Among those you will meet are a high school football player whose college dreams were derailed by a series of undiagnosed concussions, a hard-driving soccer star whose own struggles with concussions pushed her to crusade for safety reform as a coach and soccer mom, and an economist who lost her career because of lingering concussion symptoms from a fender bender. The Concussion Crisis weaves these human dramas with compelling stories of scientists and doctors who are unraveling the mysteries of how an invisible injury can wreak such havoc. It takes readers into the top labs, where scientists are teasing out what goes wrong in the brain after a jolt to the head, and into the nation’s leading concussion clinic, where patients get cutting-edge management and treatment. Carroll and Rosner analyze the cultural factors that allowed this burgeoning epidemic to fester unseen and untreated. They chronicle the growing public awareness sparked by the premature retirements of superstars like NFL quarterbacks Troy Aikman and Steve Young. And they argue for an immediate change in a macho culture that minimizes the dangers inherent in repeated jolts to the head. The Concussion Crisis sounds an urgent wake-up call to parents, coaches, trainers, doctors, and the athletes themselves. The book will stand as the definitive exploration of this heretofore-silent health crisis. It should be required reading for every parent with a child playing sports—in fact, by everyone who has ever suffered a hard bump on the head.